While living in the mountains of northwestern North Carolina offers many advantages, there are times we experience power outages due to severe weather conditions. As a result, some homeowners utilize backup, portable generators to maintain power to critical appliances. Never exceed the rated capacity of your generator. Overloading can cause serious damage to the generator or appliances. Before operating a generator, list all of the appliances that are going to operate at the same time. Then determine the starting wattage requirements and the running wattage requirements. 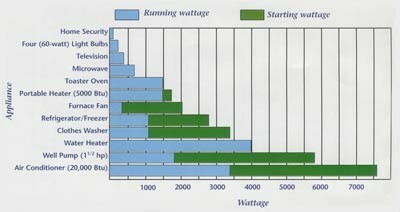 The starting load lasts only a few seconds, but it is very important when figuring your total wattage to be used. Your generator must be rated to handle the total wattage.Ratings shown above are samples. 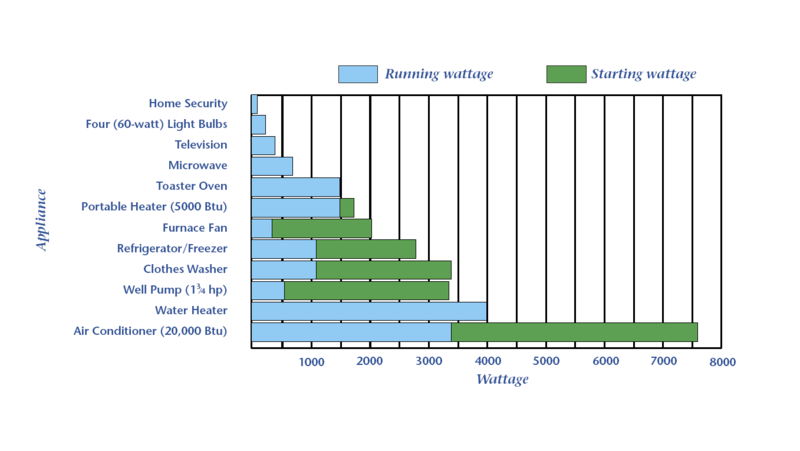 Wattage requirements vary with different brands of appliances. Be sure to check the name plate on the appliances you plan to use. Always start your largest electric motor first, then plug in other items one at a time. You can use a portable generator to supply electricity to your appliances if an emergency exists during a power outage. But if used improperly they can kill you and the people who are restoring power to your building. They also can damage the appliances you connect. Generator sizes vary. Common units can be from 8 to 14 horsepower and capable of handling from 4,000 to 8,400 watts (including starting surge requirements). Prices may range from $800 to $3,000. Connecting a generator to the main electrical supply for your house requires the services of a qualified, licensed electrician. Installing the connection and switch can cost $600 to $1,000. Before connecting the generator to your household circuits, notify Blue Ridge Energy at 1-800-451-5474. WARNING: If you connect a portable electric generator to the main electrical supply coming into the house, the electrical generator could feed back into Blue Ridge Energy's system and electrocute workers who are repairing the electrical lines.